Water damage from a frozen pipe that has burst can be a mess to clean up! This type of water damage is one of the most common and costly disasters a homeowner can experience. The good news – prevention is fairly simple. Here in Kansas City the weather can’t seem to make up its mind yet, but be assured, colder temperatures are coming. 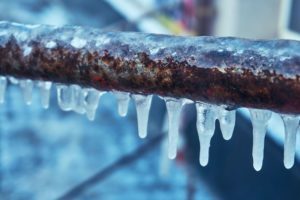 Along with freezing temps comes the risk of frozen plumbing lines and water damage from busted pipes. That’s because water expands as it freezes, and weak metal or plastic pipes that are not adequately insulated are more likely to burst or leak. In older homes it is important to check for exposed pipes along the exterior walls of the home. If they are exposed they are more likely to freeze during severely cold weather. When pipes are constantly freezing and thawing they become unstable and susceptible to bursting. Even after they thaw out pipes can still burst, causing water damage from flooding. Inside Pipes – Bathroom, kitchen and laundry room pipes are usually less likely to burst, but it does happen. Check plumbing pipes that may be hidden inside the walls or behind panels, and also make sure that water heater lines, and pipes in the basement are sufficiently insulated to prevent freezing. Check attic crawl spaces for lines to air conditioning units; if not insulated they can freeze and burst. Outside Pipes – When freezing temperatures come around homeowners often forget to check swimming pool supply lines, water sprinkler lines, garage water supply lines, and outdoor hoses because those items are not in use in winter. If not properly drained and stored they can repeatedly freeze and thaw, and burst, leading to flooding, thus causing water damage. Many pipes burst during the middle of the night when temperatures drop to below freezing. If this happens, you should immediately call a reputable water damage expert such as AAS Restoration. Then call your insurance adjuster. It is important that all wet, affected materials be removed as quickly as possible in order to prevent mold growth. The water damage experts will be able to identify and remove the affected materials. Mold grows quickly so the sooner the water is removed and the area dried out the better. Following removal of all wet items, the space needs to be completely dried out. The water damage experts have the necessary equipment to make this happen – and it takes quite a lot of equipment to dry even a small area. Heavy duty drying equipment can be costly to rent or buy but your restoration team will have state of the art drying equipment, such as dehumidifiers, fans and scrubbers, and water extraction machinery. AAS Restoration are competent, reliable water damage experts in the Kansas City area. We expect to get those late-at-night and weekend calls (because burst pipes seem to always happen at night, and on weekends, right?) As reputable water damage experts, we often work with industrial hygienists and third-party mold inspectors to ensure satisfactory indoor air quality in your home following water damage from frozen pipes bursting. If you want to prevent busted water pipes, call AAS Restoration for an inspection. We will check all of the plumbing in your home and point out any potential problems that could lead to future water damage. Frigid winter temperatures are a given in our area of the Midwest – don’t take a chance that it won’t happen to you! Give us a call today at 816-861-1550, or visit our website HERE. Posted in flooded basement kansas city, frozen pipes, water damage, water damage kansas city | Comments Off on Prevent Water Damage From Frozen Pipes – Call AAS Restoration Today!